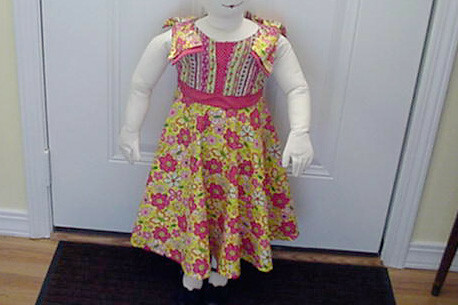 As always, I was inspired to make this dress for my daughter and decided to go ahead and create a pattern. 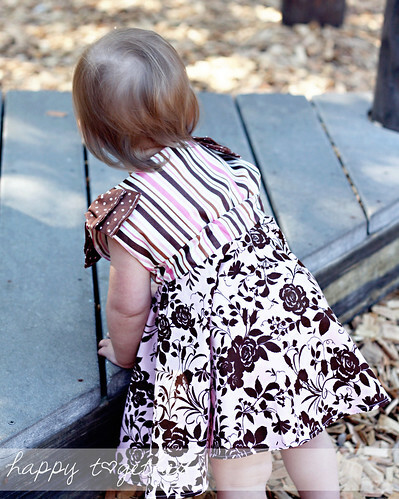 The pattern is for sizes 18 months – 8 and is designed to be about knee length for most. There are two skirt options, circle and gathered, and there are instructions on how to create the shoulder bows. The dress is created with an elastic waistband for an easy fit. The instructions are 30 pages, full of lots of pictures to help. My pattern testers help ensure that it is written well and is as easy as possible to understand for even beginner sewers. It is emailed in PDF format and comes with three attachments: instructions, pattern pieces, and a Happy Together Pattern’s Sewing Reference to help beginners understand sewing terms (also full of pictures). For those of you who cannot wait, I have a few patterns listed in my Etsy shop. And for those of you who would like to win a copy, I’m giving away 3!!!! Two here on the blog and 1 on the Facebook fan page. To enter, just leave a comment. That’s it! Please make sure to include your email address if it isn’t linked to your profile. Otherwise I can’t get a hold of you if you win. PS: Someone usually wants to know, so if you are interested in testing patterns, please email me with some pictures (or links to) of things you have sewn. Also let me know what you are interested in sewing. Thanks! Love this dress! I have never made anything clothing wise though, so it makes me nervous. I might be tempted though! All the dresses look amazing! 30 pages though is a little daunting to me. That is a totally delighful dress!!! So fresh and inspired. Icecream sundae anyone? What a sweet little dress. I have one who would love the circle skirt option, and one who would do better with the gathered option. Funny how that works out, but this is cool, both options are included! I LOVE this dress!!! Thanks for the chance to win the pattern. Oh my goodness, this dress is so cute, I even want one for myself!!! I’m sure it would look really cute on my little girls! 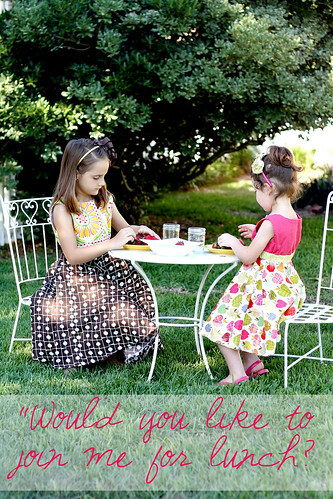 I have two little girls I would love to sew these for! Crossing ym fingers!! I would love to win a copy! 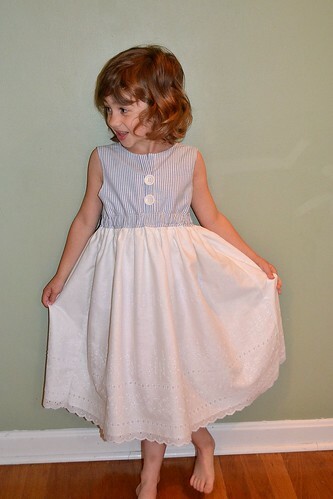 I have a 14 month old and 11 yr old daughter and a 3 yr old niece to sew for! I would love to win a copy! 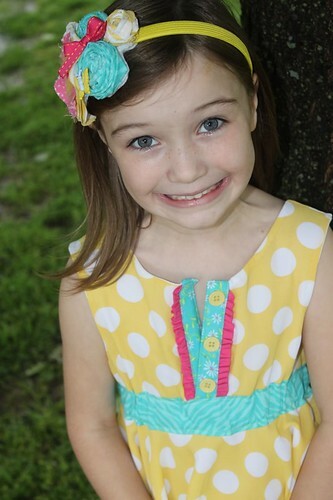 I have 14 month and 11 yr old daughters and a 3 yr old niece to sew for! Ohhh Pick me. Found your site today & your style is right up my alley. Best of luck to you with your blog & Etsy shop. I’ll be following for sure now 🙂 Cute Cuteness! Such a cute dress! My nieces would look so cute in this! Gorgeous. 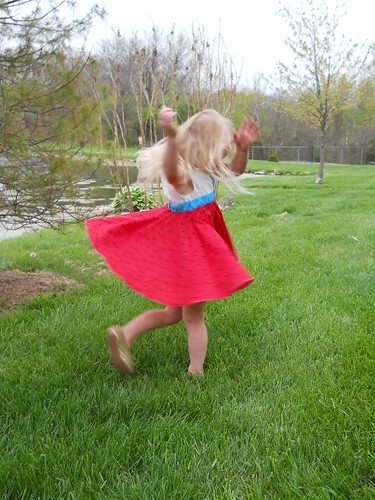 That circle skirt variation is so good for twirling. My little girl would love it! That dress is adorable! Thanks for a chance to win one! This is one of the cutest dress patterns I’ve seen in a while! I would love to make this for my little girl! Dresses are all beautiful, girls look so happy. My daughter would love the way it spins! What a cute dress!!! Would love to try it out. Thanks for a chance to win!!! Can’t wait to see more of your patterns….please design some with sleeves too! Gorgeous looking dress! Would love to make for my daughter! All the dresses look super! the dress looks gorgeous! i’m still a beginner and i would love to try this one out. 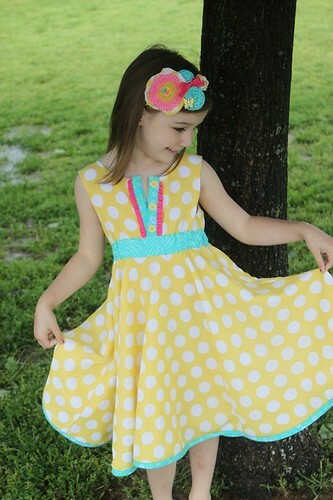 My daughter loves the yellow dots circle dress and has asked me to enter. Super cute dress! I am sure my nieces would look so chic in it! Love all the pictures of the variations of the pattern! I make handbags, diaper bags, and just started on little dresses! I am such a sucker for patterns that have sizes to include both my girls, who are 7 years apart. It’s beautiful! Adorable! 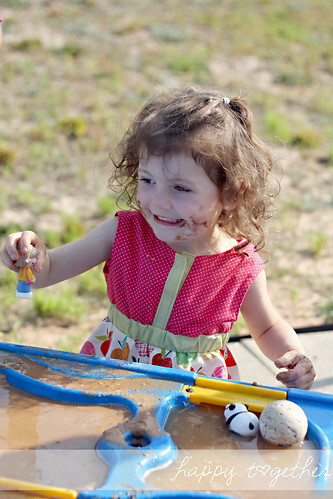 My little girls would especially appreciate the twirl factor to this dress! They are just beautiful. I would love to sew one and I always consider the more pages the more detail instructions. too cute i’d love one of the patterns! if i don’t win i’ll prolly go buy one right away lol. This dress is darling! I would love to make it. Super cute dress! I would LOVE to make them for my girls! What a beautiful dress. I can hear my daughter now calling it her princess dress. Love this pattern! My granddaughter would love the twirliness! So So Cute! 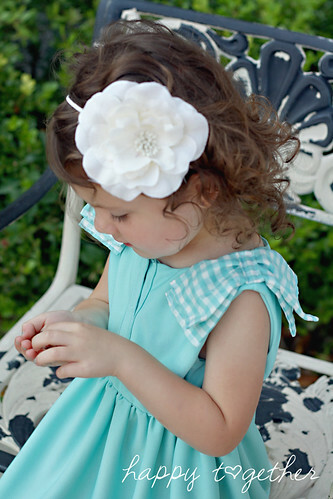 The perfect little girl dress! Love it! 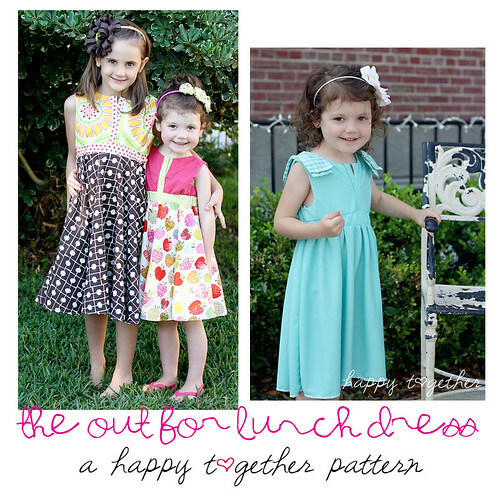 We would love to have a new dress pattern! Super cute dress! Thanks for the giveaway. This pattern is absolutely adorable! I would love it!! I am always looking for new dress patterns!! So cute!! Love the twirly skirt!! What a cute dress!! I would love a copy to make some for my daughter and niece! Thanks for the great giveaway!! Me me me! Pick me! I love it! This dress would be just right for my little girl! What a beautiful dress pattern!!! Fantastic!!! i love that it has no button holes and no zippers! a versitle pattern for sure! Love your new dress pattern! Would love to win it. I love this dress!!! Thanks for the opportunity! cute ! I’d love to win a pattern! Very cute and very fun! I will have to get it for my own daughter! I love it! Pregnant and still making amazing things! I would love to win. also those models are simply hilarious! Fantastic pattern! Thanks for the chance to win it!! I love this dress!!!! I wish I could win one!!! Thanks…. Sew pretty!!! 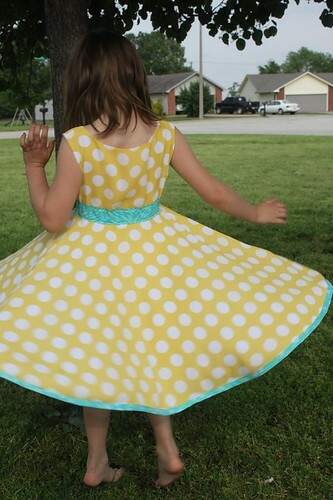 Love the circle skirt and the yellow polka dot dress is just GORGEOUS!!!!! Very cute and original. I love it. I saw Nicole’s version on Sewforum. I just love this pattern! Wow. It is beautiful. 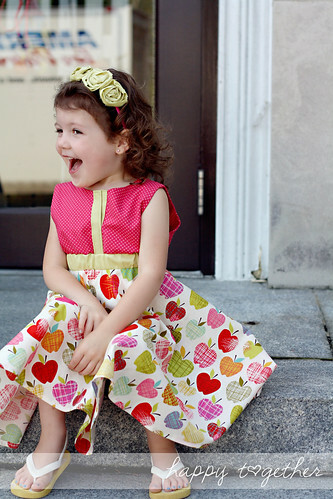 Love this pattern – my fav is with the circle skirt option! 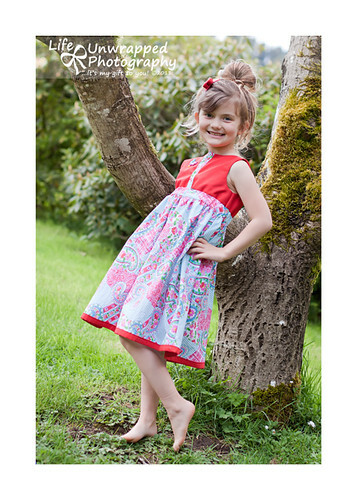 Cute, twirly and a little bit retro! This dress is soo cute. I would love to make one for my neices. You are so talented! Sweet dress and I love the variations. Your testers also dis a wonderful job! Love this dress! Its so adorable. Love the dress. Too bad I only have little boys to sew for. My nieces would love one though! That is an adorable dress! I would love to make it for my daughter. love this dress! i have 3 girls who would love it too! 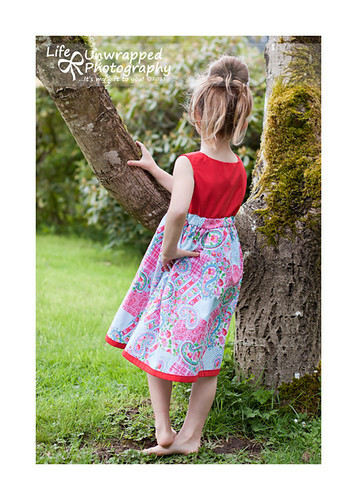 Since having my daughter I have become obsessed with little girl dresses and sewing…not that I am any good at the latter, but this pattern might give me the opportunity to improve. Wow this is a great dress!! ooh, this would be a fun thing to make my little one, and FUN baby gifts!! Cute pattern, Hurrah, something different. I’d love to win one. So cute! Love the bow on the shoulder! Such a cute dress! Thanks for the chance! What a gorgeous pattern. Thanks for the giveaway! OH, I would love to give it a try! Love, love, love the circle skirt!! This dress is so so sweet! I love it! I hope I win!! Thanks for the chance! Love Love Love it ! You and Nicole ROCK with your sewing! This pattern is beautiful. I don’t have a daughter but I love sewing for little girls anyway. Maybe one day I will get a niece… fingers crossed. I love the waistband idea…no bows to tie or belts to find early on a schoolday morning. I love the out to lunch pattern. I wish it came in adult sizes. Hope I win. Adorable! This dress looks so comfy and sweet! Such a cute dress! My girlie girl would go nuts over the big twirly skirt! Love this dress and how many sizes you included!!! 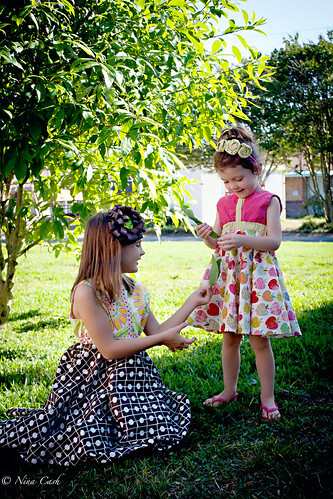 Aw I would love to make this dress for my girls!! I’m sewing again, so I’m sure I’d be happy to read all of your instructions – bring it 30 pages!! Very very lovely dress!! Oops, and my email is..
Lovely dress (as always)! Thanks for the chance to win. Very cute! I love all the options! I love this dress!! Great pattern! You have some awesome pattern testers. Thanks for the giveaway and the chance to win! Oh my gosh! What an adorable pattern!!!! I just love the circle skirt option but think each of the other options are just as cute. My granddaughter would love one of these. I ABSOLUTELY LOVE this dress! Hope I win! What a cute dress! And so many ways to change it! Yeah, I would love to win…I have two girls who love dresses! These dresses are oh so cute. Adorable!! Can’t wait for my baby girl to grow up just a bit so I can make her some dresses too! Adorable dress! It should come in adult sizes too! I would love to make this for my daughter! Sweet! Thanks for the opportunity to win. This is a sweet pattern. So stylish for every age. Love your blog with all the inspiration!! Very cute dress. My daughter loves it. Love this dress…so cute! Would love to win a pattern! I love it!!!! I would LOVE to win a copy! I’d love to win it and I can’t wait to make one myself! super super cute. I love it! I love that dress! It would be precious on my granddaughters. Thank you for the chance to win! This dress is adorable!! I have 3 little girls that I would love to make these for!!!! Looks like a fun pattern! 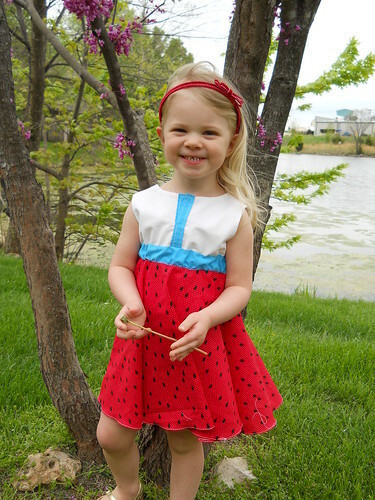 I have an active thirteen-month-old, and she would look adorable twirling around in this dress! I hope I win! 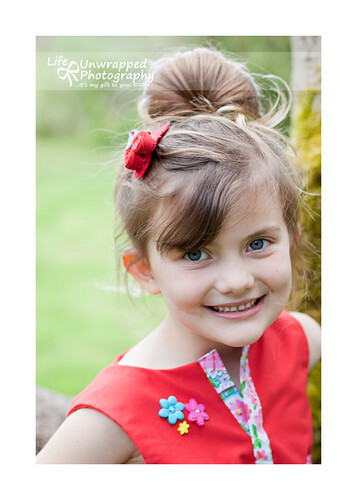 What a fab little dress – my daughter would love it if I made one for her! Cute dress!! Thanks for a chance to win an adorable pattern. 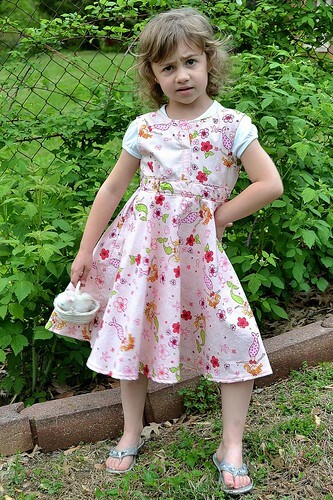 Love the pattern, I would love to sew for my grandnieces! So darling and creative…count me in! What a beautiful pattern! I love the different options you included, the circle skirt is probably my favorite. Thank you for giving us the opprotunity to win this pattern! Love the dresses!! They are all adorable! I have been wanting to make a circle skirt…..so sure, why not a circle dress! That circle skirt option is just too stinkin cute. I would love to win a pattern! Sweet- my girls would love this dress . . . I would happily read through your pattern! I would love to win this: andreajtuttle at gmail dot com! Thanks for the chance! I love this dress! So cute! I would love to win! meganderson02@gmail.com Thanks! 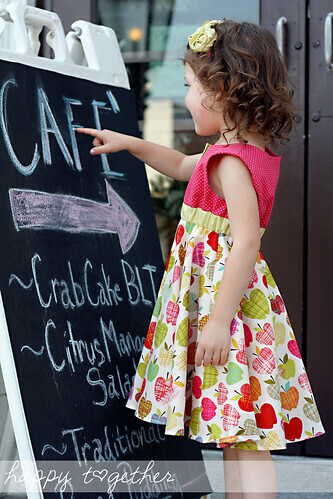 I’d love to win this…totally cute dress! Love this! So many options to change it up! Thanks! these are adorable! I want to win! I love that pattern, and with 6 nieces, I’m sure I can put it to good use! Beautiful! Can’t wait to make it for my little girls. I know there isn’t much chance of me wining but I had to have a go! Awesome dress! It is so stinking adorable! Adorable!!! I am happy to hear you’ve got 30 pages of fully-explained (and photographed) instructions – sounds like even I could do this one 🙂 I’ve never tried to make such a super cute dress, but oh boy I’m willing to try it!!! Love the dress and it looks like a fun project to take on! I am trying to get it in gear and sew more for my lil miss, this is just our style. I would love to try out your pattern. It’s super cute. I’d LOVE to win, beautiful dress!!! This is one of thr cutest and most unique dress patterns I have seen lately. Would love to make one! This is an adorable dress. I love it. 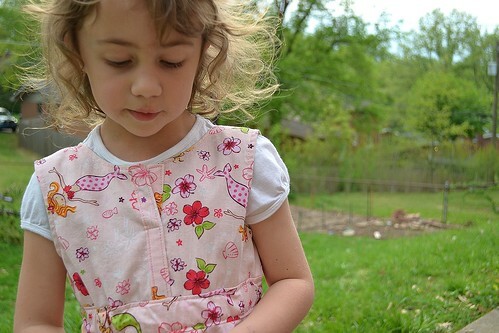 I could make all kinds of dress for my little girl and her friends, that all wear dress all the time. This dress is so cute. I have a 2-year-old who would look adorable in it! This pattern looks like a great way to use up some fabric scraps. Thanks for the giveaway! So cute! I normally stay away from patterns because of how difficult they can be but I bet yours is user friendly, thanks! Cute dress! It’d be fun to make coordinating ones for my 3 girls. ooh awesome!! love this dress! This is so adorable! I love sewing for my girls, myself, and others! Thanks for sharing another beautiful creation. What a darling dress!! I would so love to win this give away!! Love it!! Finger’s Crossed!! Thanks. So cute! Perfect for spring/summer! Love it! wow! Awesome design. Nice to have some options and my girlie girl would LOVE the circle skirt. the spinnier the better! Love the new dress Jess! Fabulous!!!! obviously I am too late for this giveaway, but where can I purchase the book? I’m not even sure how I came about your blog, but I am LOVING it!! You seriously make me want to go buy a sewing machine. like, now! 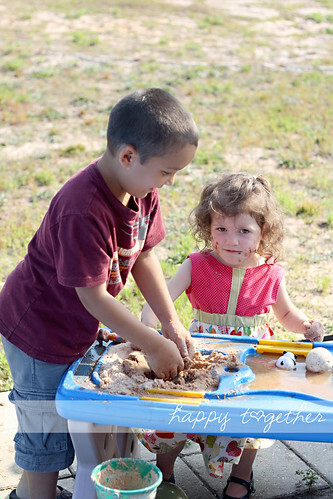 This just may be my new favorite blog!